The political subdivision (a city, school district, taxing district, etc.) audited through the petition process is responsible for the cost of the audit. Petition signatures must be from registered voters who live within the boundaries of that political subdivision. The petition and signatures must be submitted to the State Auditor’s Office within one year of the initial request. The person who submits the petition and signatures to the State Auditor's Office (the chief petitioner) must be a property owner or resident of the political subdivision. In accordance with 29.230.4, RSMo, an individual may withdraw their signature within ten days after the petition is received by the State Auditor's Office by completing the signature removal form and submitting it to the State Auditor's Office by email at petitions@auditor.mo.gov or by mailing the completed form to the following address: Missouri State Auditor's Office, ATTN: Petitions, P.O. Box 869, Jefferson City, MO 65102. When petition forms are received, the political subdivision name and date of receipt will be posted below. 1. What is a petition audit? 2. Who can begin the petition audit process? 3. How does someone initiate a petition audit? 4. Who can submit the petition? 5. Do signatures have to be submitted on a special form? 6. How many signatures are required? 7. Who can sign the petition? 8. What is the deadline to submit signatures? 9. What happens when the State Auditor receives the Petition Audit Submission and Petition Signature forms calling for an audit? 10. Can a signature be removed from a petition submitted to the State Auditor’s Office? 11. Are the petition signature forms and signatures considered public records? 12. Once a petition is on the list of audits to be performed, how long before work will begin? 13. What happens once the audit begins? 14. What does an audit cover? 15. What is the typical cost of an audit, how is it determined and who pays for it? 16. How are petitioners informed of the progress of the audit? 17. How is the public informed of audit results? 18. What happens if the auditor uncovers something serious, like potential fraud or a large amount of money missing? 19. How are report recommendations enforced? 20. How does a petition audit performed by the State Auditor’s Office differ from the audit performed by a CPA firm? A petition audit is an audit of a political subdivision (typically a local government entity), which is conducted at the request of registered voters who live within its boundaries. Upon receipt of a petition that includes the required number of valid signatures, the State Auditor will begin the audit, and the local government entity being audited is responsible for the cost. A political subdivision may not be audited by petition more than once every three years. Anyone can start the process to initiate a petition audit by submitting a Petition Audit Request form to the State Auditor's Office. The name of the person who submits the initial request is a public record and may be disclosed to interested parties or the media, if requested. The requestor or person circulating the petition and collecting signatures does not have to be a resident or registered voter of the political subdivision; however, the person who submits the signatures to the State Auditor's Office, known as the chief petitioner, must live or own property within the designated area. The process begins when the State Auditor's Office receives a completed Petition Audit Request form, which is available online or may be requested by phone or email. The completed Petition Audit Request form should include all concerns so the State Auditor’s Office can provide an accurate estimate of the cost of the audit. Incomplete forms will not be considered and will be returned. Individuals can contact the State Auditor's Office by phone or email for information. The person who submits the petition and signatures to the State Auditor's Office (chief petitioner) must live or own property within the boundaries or area of service of the political subdivision. The submission should include the Petition Audit Submission form and Petition Signature form. The chief petitioner must confirm residency or ownership of property at this time. The name of the chief petitioner is a public record and may be disclosed to interested parties or the media, if requested. Yes. The State Auditor's Office will provide a Petition Signature form, which will include an estimate of the cost of the audit, as required by state law. The required number of signatures is generally determined based on the number of voters in that political subdivision who voted in the most recent election for governor. If that number is less than 1,000, the required number of signatures is based on the number of registered voters who were eligible to vote in the most recent election that included a governor's race. The office recommends petitioners collect additional signatures above the required number to allow for any invalid signatures. A signer must be a resident of the political subdivision and a registered voter. Signatures must be received within one year of the date the Petition Audit Request form is received by the State Auditor's Office. If the required number of valid signatures is not received within one year, the petition will be void. If the signature form includes enough signatures, the State Auditor’s Office sends a copy to the local election authority (typically the county clerk) to verify the signatures are of registered, resident voters. If there is a sufficient number of valid signatures, the petition is considered "active" and the State Auditor's Office notifies the chief petitioner and the entity being audited. The petition information is added to the list of upcoming audits for future scheduling. If the signature requirements are not met, the petition is returned to the chief petitioner for additional signatures. Any additional signatures must be submitted within the original one-year period. Yes. Section 29.230.4, RSMo, allows a person to withdraw their signature within ten days after the petition is received by the State Auditor. When petition forms are received, the political subdivision name and date of receipt will be posted on our website. The website also includes a form that may be completed to remove a signature from a petition. Yes. Once the Petition Audit Submission form and Petition Signature form are received by the State Auditor’s Office, they are public records, including all signatures received. All working papers, including any concerns, are confidential. The State Auditor’s Office meets with the governing body of the entity being audited in a meeting to explain the audit process and answer questions. This meeting is open to the public. Auditors then enter the fieldwork phase, which includes gathering records and information. Once the report is drafted, a copy is shared with the governing body in a closed meeting to discuss the report findings and begin the process of obtaining responses from the entity. Those responses are included in the final audit report. The scope of the audit is partially based on information provided, including concerns from the chief petitioner and citizens. Petition audits cover the current period and most recently completed fiscal year when the petition becomes active and the audit is scheduled, with any revision in scope to be determined by the State Auditor’s Office. Audit costs vary depending on the size and scope of the entity and audit. The estimated range of costs listed on the petition is based on historical experience auditing entities of a similar size and type with similar concerns. Audit costs are based on staff work hours and expenses. The auditors working on a petition audit track the time incurred on the audit. The cost of those hours plus any direct expenses make up the audit bill. Actual costs may vary from the original estimate stated on the petition and state law requires an entity to pay the actual cost of the audit even if it exceeds the estimate. The chief petitioner will be notified once the petition is considered active, and again when the audit is scheduled. The results of the audit will be available to the petitioner(s) and the public once the audit is completed and released. Section 29.070, RSMo, prohibits employees of the State Auditor’s Office from revealing information secured in the course of an audit. At the conclusion of some petition audits, a public meeting is held in the political subdivision. When a public meeting is not held, a press release will be issued. News releases and audit reports are available on the State Auditor’s website. If information is uncovered that indicates ongoing criminal activity or fraud, the State Auditor’s Office informs the proper authorities as soon as possible. In less serious cases, the audit report will note the problem and recommend the proper authorities correct the situation. The State Auditor’s Office cannot require an entity to implement the recommendations. However, if an entity receives a rating of poor, the State Auditor may conduct a follow-up review to monitor implementation of audit recommendations. For the follow-up report, auditors work with the entity to establish a timeline for the follow-up review and assessment. 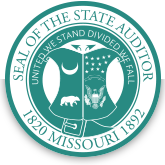 The State Auditor’s Office conducts audits in accordance with standards contained in Government Auditing Standards, issued by the Comptroller General of the United States. Petition audits conducted by the State Auditor’s Office are performance audits and will not fulfill requirements the political subdivision may have for a financial statement audit, including federal and state grant requirements and bond or loan requirements. When conducting a performance audit of an entity that has already had a financial audit, the State Auditor’s Office will review the independent audit in order to avoid duplication of effort.